You won't have to travel far and wide to reach this unique island getaway in Florida. 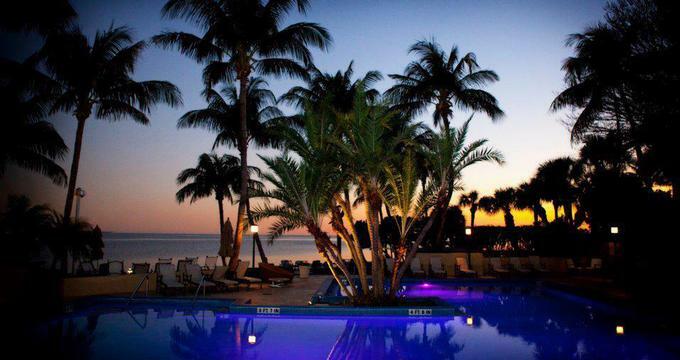 Grove Isle Hotel is a set on 20 acres overlooking Miami. There are just 50 spacious guest rooms with views of Biscayne Bay. Guests have access to a private 85-slip marina, fitness, tennis and a luxury spa. If you've been dreaming of a spa vacation to an exotic destination like Thailand or Bali but can't spare the time, a trip to this unique spa is the next best thing and it doesn't require a long airplane flight. The 6,000 square foot SpaTerre offers treatments with Indonesian, Thai and Balinese influences. Couples can book a side-by-side massage, detoxing wrap or a pedicure at this unique wellness center. The spa uses many of the herbs, minerals and essential elements indigenous to the area. Vacationers have access to a full line of body treatments, salon services, facials, rituals, massage therapies and a Watsu massage pool. Luxury Bay Room: Enjoy stunning Biscayne Bay views from your private balcony. The rooms feature a four-post canopy bed, a pillow-top mattress and Italian marble bathrooms. Luxury Bayfront Room: Decor of these rooms reflects Colonial elegance with custom fabrics, marble bathrooms, unique art and balconies. Grand Luxury Bayfront Suite: Situated at the corners of the hotel, the suites offering multiple views of the bay from large windows. There is a flat-screen plasma TV, a four-post king bed, and a separate sitting area with dining table. Grand Luxury Bay Suite: These are the largest accommodations, measuring 700 square feet. The bedroom has a romantic king canopy bed. The suite has three televisions and scenic views of the marina. Plan a romantic getaway or a wedding to this unique destination in Florida. The hotel has a dedicated team that will help you plan your dream wedding. Say "I do" with the view of the beautiful Biscayne Bay at sunset and invite your guests to dance in an elegant waterfront ballroom. The hotel can host wedding receptions, rehearsal dinners, bridesmaid lunches, groomsmen golf outings, and other events. Choose from 8,000 square feet of event space, from the 3,600 square foot Grand Ballroom to smaller banquet rooms and reception halls. Once you are done relaxing at the spa, relax next to the pool, hop into the hydro-massage whirlpool, go jogging along the scenic path by the water and work out at the fitness center. Cliff Drysdale Tennis Center has 11 Har-Tru Tennis Courts and one U.S. Open Hard Tennis Court. You'll be close to Coconut Grove and a short drive from South Beach. Gibraltar Restaurant offers formal dining for breakfast, lunch and dinner. Sunday Brunch is served from 11:00am – 3:00pm. Guests can also dine wherever they desire, whether that's by the pool, in the tropical gardens, or their room terrace. Live entertainment is often on certain days of the week. Rooms start at $145 per night. You can bring your dog with you - the hotel offers waterfront walking trails and several dog-friendly rooms. The property frequently offers packages and seasonal specials. "Grove Isle Perfect Escape Package" (requires 2 nights minimum stay) includes a 15% savings at the spa, $50 dining credit, 2 free drinks.